Carotid artery stenosis occurs when the carotid arteries narrow. 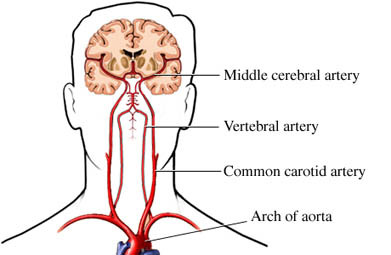 The carotid arteries are major arteries found on each side of the neck. They supply blood from the heart to the brain. This condition is a major risk factor for ischemic stroke . Ischemic stroke is when blood flow to the brain is blocked due to blood clots. Carotid artery stenosis is caused by the build-up of plaque along the lining of the arteries. This build-up is known as atherosclerosis . Plaque is made up of cholesterol, fat, and other substances. Eat a healthful diet . If you smoke , talk to your doctor about ways to quit . If you have diabetes, get proper treatment. If you have high cholesterol, work with your doctor to lower the levels. If you have high blood pressure, work to get it under control. Surgery may be needed if the arteries have severe plaque build-up. One kind of surgery is called carotid endarterectomy . This involves opening the artery and cleaning the plaque from it. Another surgery that may be done is carotid angioplasty and stenting. In this surgery, a balloon is inserted into the artery to widen it. Then a metal mesh, called a stent, is inserted to keep the artery open so that blood can flow freely. Eat more fruits and vegetables . Limit dietary salt and fat . If you drink alcohol, do so only in moderation . This means having no more than 2 drinks per day if you are a man, and no more than 1 drink per day if you are woman. Keep your blood pressure in a safe range. Follow your doctor's recommendations if you have high blood pressure. Keep other conditions under control. This includes high cholesterol and diabetes. Carotid artery stenosis. EBSCO DynaMed Plus website. Available at: http://www.dynamed.com/topics/dmp~AN~T116329/Carotid-artery-stenosis. Updated December 29, 2015. Accessed March 1, 2018.